In case you missed it, we are running a rare concert series to see Shostakovich’s full quartet cycle that is proudly sponsored by Mission Hill Family Estate. During our recent meeting with the good people from Mission Hill, we discovered a similarity between how we talk about music and how they describe wine. Whether we are talking about wine, or food, or art, or music, we talk about “taste”! What taste or flavour do you like? Do you share your taste with family or friends? In terms of wine, people who know more about it than me often discuss “terroir” or the local soil because it can give a distinctive flavour, colour and look to a wine. Possibly the most famous terroir in the world is found in the Burgundy region of France. Even though the same types of grapes, pinot noir for red and chardonnay for white, are grown and made into wines someplace else, the wines will not taste like Burgundy red or Chablis white. In fact, people with trained palates can tell where the wine comes from, down to the precise portion of the vineyard where the vines grow. The same thing is true in music! Composers write music and their notes are the grapes. Different musicians can play those notes, but they will taste or sound different based on the tradition behind the training of those musicians. While this has been true for orchestras, with their big blends of sound (think blended Bordeaux-style wines), that difference in taste is even more distinct in chamber music! With our upcoming Borodin Quartet 70th Anniversary Celebration, we have a rare opportunity to experience the sound of an “old vine”. This group is old enough to have a special Russian terroir, no matter what they play –but especially in their interpretation of Shostakovich’s quartets. 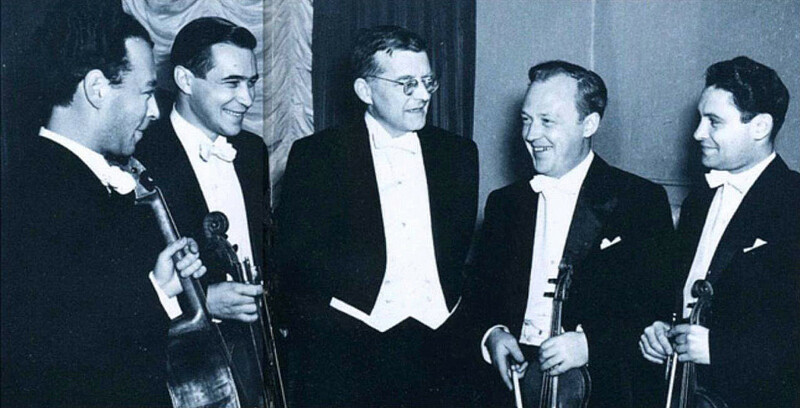 Shostakovich spent much time rehearsing the pieces with the original members of the Borodin Quartet, offering suggestions as to how the quartets should be performed for the 1969 Friends presentation of the cycle. This specific musical direction has been carefully passed down from musician to musician, creating a distinct style and flavour not found in other interpretations. Shostakovich’s quartets are now famous enough that you can find great performances, both live and in recordings, by quartets with different tastes, from other terroirs. The British tradition has brought fine recorded cycles by the Fitzwilliam Quartet and the younger Brodsky Quartet. The American tradition has done equally well with great recorded cycles by the Emerson String Quartet and more recently the Pacifica Quartet. And the German tradition has brought a very fine recorded cycle by the Mandelring Quartett. Keep in mind that all but the Brodsky Quartet have played concerts for Friends in Vancouver. For more information, or to purchase tickets.